Now that we’ve been in technical expansion for 4 years and adding jobs for more like 3 years on a sustained basis, more and more discussions are turning from the durability or sustainability of the recovery to the quality of the recovery. That’s not to say the pace of expansion is acceptable or even modest by historical standards, and, yes, many dark scenarios remain (China, Europe, austerity, etc), however the risk of recession has certainly fallen in the past couple of years. Given that Oregon has now regained about 56% of the private sector jobs lost in the Great Recession, questions are being asked about which industries these jobs are in and whether they are “good” jobs or not. 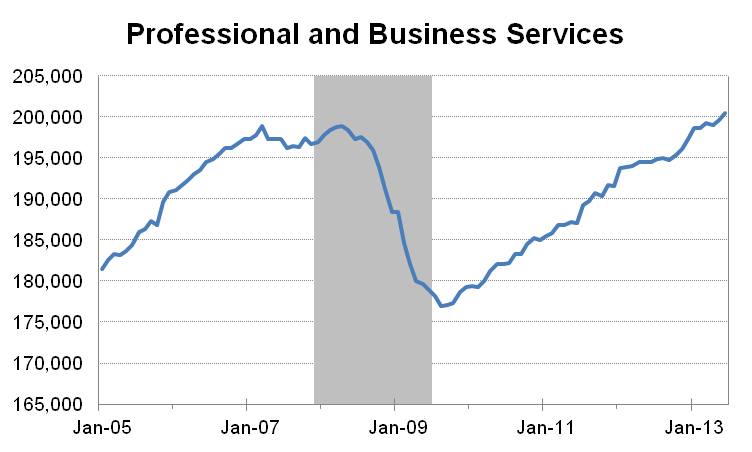 This post takes a quick look at one of the leading sectors in the economy, at least in terms of employment: Professional and Business Services. Overall, jobs in the industry fell 11% but have rebounded at an annualized 3.3% rate since late 2009. Today these jobs are at an all-time high and a few thousand above pre-recession levels. This stronger growth and being a leader in expansion was not unexpected. As the economy continues to evolve and transform from the more traditional manufacturing-based economy into a more service-based one, better job growth in professional and business services is and was expected. Now, a lot of times when discussing employment trends we only focus on these bigger industries and don’t dive down into more granular details. However with that sharper focus on the quality of the jobs being created, it is important to try and understand just what type of jobs are being created. 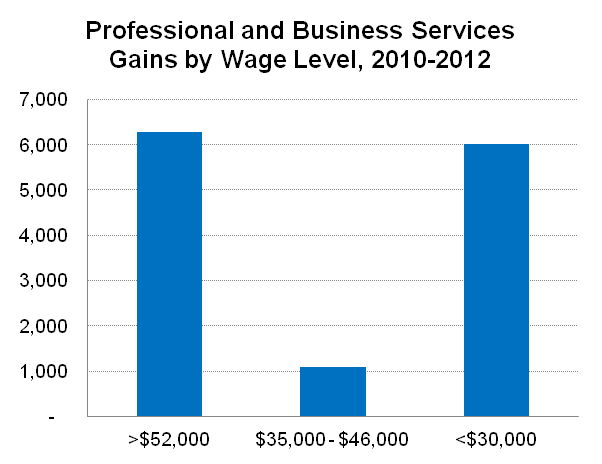 The graph below breaks out these professional and business service jobs into smaller industries or groups of industries. One can even go further and look at more details, however I believe these categorizations provide a good overview and understanding of the dynamics within the larger industry. The actual number of job gains do seem to be a bit concentrated in those top 4 or 5 listed groups, however it is important to note that nearly all sub-industry groups have seen gains in the past couple of years. As you read down the list and see the size of employment gains, your mind may turn to the wages and quality of jobs within these groups. The statewide average wage in 2012 according to the QCEW was about $44,300, so I have grouped the job gains shown above into three buckets based on industry wages. The results indicate that job gains in high-wage industries actually outstrip low-wage industries, albeit barely. Overall we see similar levels of gains in both the high-wage and low-wage industries with none in the middle-wage industries. The fact that there have been high-wage gains at least on par with low-wage gains may come as a surprise to some as it is not generally part of the standard narrative. Note that this is the same general pattern seen in job polarization throughout the economy and we finally have light at the end of the tunnel for the polarization report I have been mentioning for over a year now. It will be released later this summer or early fall. The graph above shows where the job gains have been in recovery, however what does the picture look like when trying to gauge trends since peak? 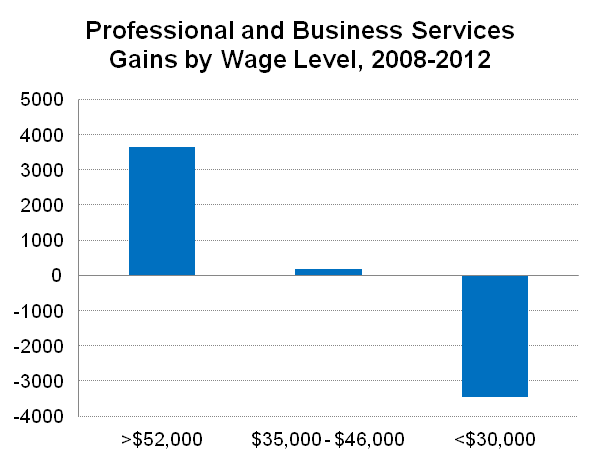 Again, using annual data, the graph below shows job gains by industry wages from 2008 to 2012. Over the four year period Oregon has actually seen a net gain among the high-wage industries, essentially no change in the average-wage industries and have still lost jobs on net among these low-wage professional and business service jobs. One reason for this is the cylicality of something like temp workers (or employment services, more accurately). While these jobs have rebounded in recent years (and some think they are also a leading indicator) they remain below pre-recession levels as they declined substantially (-15%) from 2008 to 2010. Finally, I will also point out that while professional and business services have been a leader so far in expansion and our office looks for this broad industry to continue to outpace job growth overall, these jobs are not evenly spread throughout the state. 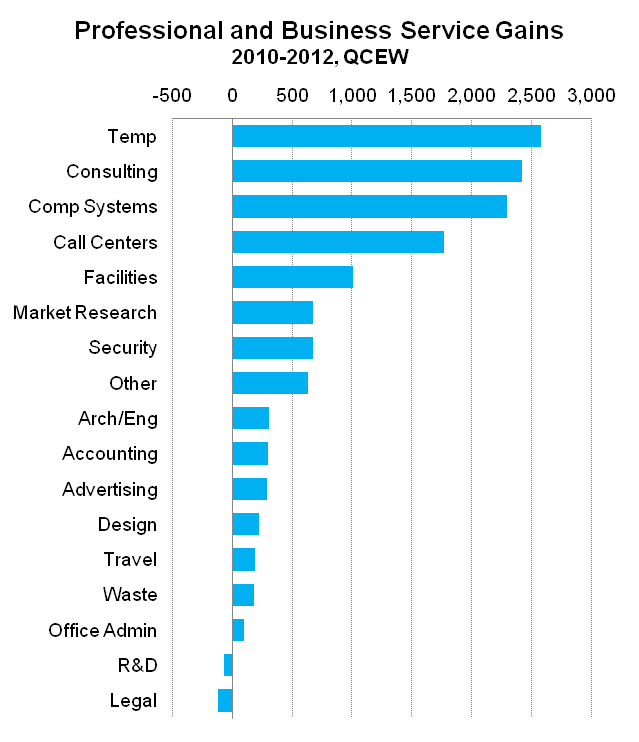 Nearly 84% of the gains from 2010 to 2012 in the industry have occurred in the Portland MSA. We know that large cities both turned around first in expansion and have been the major driver of growth so far in recovery, however now that recovery is spreading to more or more regions of the state and country, job growth is beginning to pick up.